This Easy Greek 7 Layer Dip is loaded with all the best flavors of the Greece in dippable form! Garlicky hummus and yogurt, crunchy cucumber, juicy tomatoes, and savory feta and pine nuts are perfect for dipping pita chips and sharing as an after school snack or wonderful party appetizer! 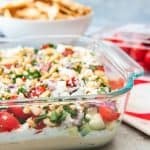 In an 8”x8” square glass dish, layer the hummus, yogurt sauce, cucumber, grape tomatoes, red onion, feta cheese, pine nuts, and parsley. Serve with pita chips, crackers, or vegetables for dipping.